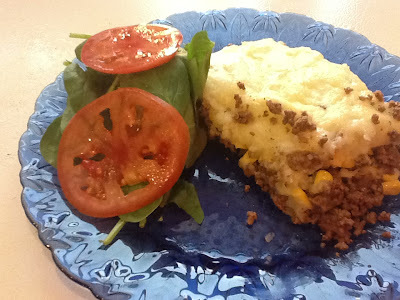 My hubby has a few signature dishes and one of the family favorites is his take on Shepard's Pie... I sometimes double the recipe and freeze one for a really quick dinner to throw in the oven on busy nights. This is also a great way to use up leftover mashed potatoes! 2. Peel and dice potatoes. Boil until done, then mash with butter, pepper and milk. 3. Brown diced onions, garlic and ground beef together. Drain fat from ground beef mixture, add frozen corn and spread on the bottom of a 13x9 pan. 4. Spread 1 cup of cheese over the ground beef mixture. 5. 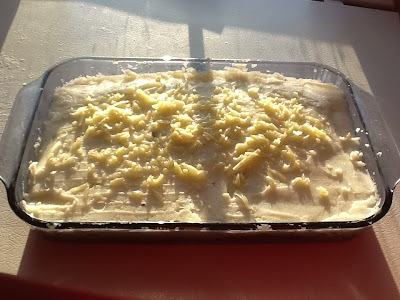 Spread mashed potato mixture over the cheese. 6. Sprinkle remaining 1/2 cup of cheese on top. 7. Bake for 30 minutes and serve. We sometimes pick up the Birdseye Southwest Corn to add a little extra kick... and another alternative is to add some chili powder or taco seasoning to the ground beef... it's a really simple casserole that freezes well - just omit the final step - you can bake directly from the freezer in about 40 minutes or defrost in the fridge overnight!